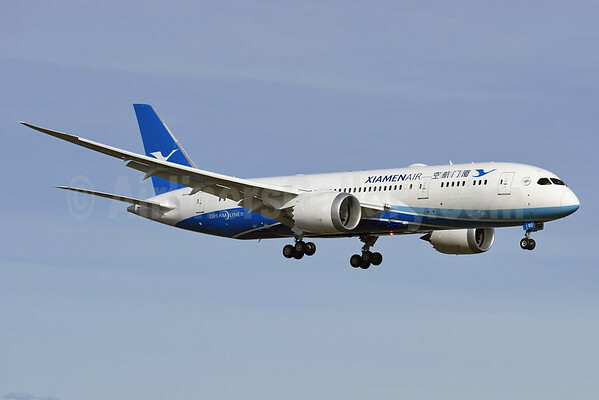 Xiamen Air (Xiamen) plans to launch its first European route to Amsterdam from Xiamen starting on July 26. The new route will be operated three days a week with Boeing 787-8 Dreamliners. Copyright Photo: Steve Bailey/AirlinersGallery.com. Boeing 787-8 Dreamliner B-2760 (msn 41540) approaches the runway at Paine Field near Everett before the handover. This entry was posted in Xiamen Air and tagged 41540, Amsterdam, B-2760, Boeing, Boeing 787, Boeing 787-8, Boeing 787-8 Dreamliner, Everett, PAE, Paine Field, Xiamen Air on April 12, 2015 by Bruce Drum.